F. Scott Fitzgerald was a renowned American writer who is best known for his novel The Great Gatsby, as well as other novels that he wrote in the Jazz Age. He based his novel Tender is the Night on his wife and her bouts with mental illness. This famous author struggled with his alcoholic addiction most of his adult life. Fitzgerald was born in St. Paul, Minnesota, in September of 1896. He is of Irish descent and his parents were children of Irish immigrants. His father had been a salesman and manufacturer. Fitzgerald went to the St. Paul Academy as a child. He also went to the Newman School from 1911 to 1913. After graduation from there, he enrolled in Princeton University in 1913. His writing pursuits interfered with his academic courses at Princeton. He was put on academic probation, and later in 1917, Fitzgerald dropped out of the university to join the army. Before reporting to the army he wrote The Romantic Egotist. His work was rejected by several publishers, but one told him to submit more work because he did have writing talent. Fitzgerald became a second lieutenant in the U.S. Army’s infantry and was sent to Camp Sheridan, near Montgomery, Alabama. He met and soon fell in love with Zelda Sayre, the daughter of one of Alabama’s Supreme Court justices. Fitzgerald was never deployed during World War I, and after he left the army, he relocated to New York City. He hoped to begin an advertising career. Before long he found work at the Barron Collier, an advertising agency. During this time, he wrote This Side of Paradise, which was a semi-autobiographical about the years he spent at Princeton. The novel was accepted by a publisher (Scribner) in the autumn of 1919. After the novel was published in March of 1920, it became very popular and sold well. Fitzgerald married Zelda in New York at St. Patrick’s Cathedral. Their only child, a daughter, Frances, was born the following year. In 1930, Zelda experienced her first schizophrenic attack. Her physical and emotional health continued to be fragile for the remainder of her life. The couple split up many times during their marriage. She passed away in 1948. 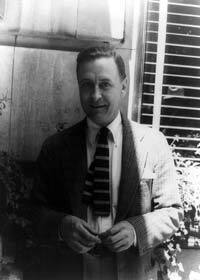 Fitzgerald wrote many short stories for magazines such as Collier’s Weekly, Esquire and The Saturday Evening Post. He wrote a few more novels, The Beautiful and Damned, Tender Is the Night, and in 1925, his most famous work, The Great Gatsby. In 1937, Fitzgerald went to Hollywood to write screenplays for MGM. In 1939, his contract with MGM ended, and he became a freelance screenwriter. By this time in his life, he was estranged from his wife and struggling with alcoholism. He was also having an affair with Sheilah Graham, a Hollywood gossip columnist. He experienced two heart attacks during the late 1930s. In December of 1940, Fitzgerald died of a heart attack when he was 44 years old. Many famous writers have said F. Scott Fitzgerald had inspired them to write. His books, especially The Great Gatsby, have sold millions of copies and for many schools this well-known novel is required reading.